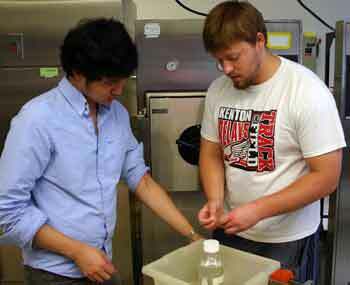 Each summer, Wabash College professors oversee student lab interns. The program has become an invaluable part of the Wabash education. 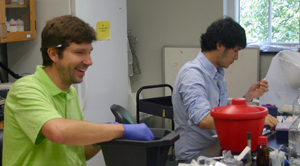 Seniors Joe Granger and Michael Wittman along with Junior Shangqing Li are working in the chemistry labs this summer gaining experience most undergraduates cannot get. One of the main reasons Dr. Walter Novak chose to come to Wabash was the ability to work side-by-side with students in laboratory settings. Novak loves doing research but admits it is not much fun doing it alone, and he really enjoys having students participate in these opportunities. Granger has experienced both the joy and frustration of the research. Granger has been working with a protein which is an iron dependent regulator (meaning in the presence of iron it bonds) and is now seeing the fruits of his hard work from the past few months. “I struggled for a month and a half during the school year because my gel wasn’t consistently working, but now everything is working consistently, and I am getting good results,” Granger said. Granger’s experience is exactly what the labs are intended to create. It is hard to overlook the excitement Dr. Novak and the other students have for Granger’s recent successes. All three of Dr. Novak’s understudies plan on attending graduate school after Wabash, but are not exactly sure where that will take them. What the three do know is how great this experience is when it will come time to apply for graduate school. In both the students’ experiences and Dr. Novak’s, this kind of research is not available for undergraduates at many state schools. As their projects come to their conclusions over the next week, the three students are thankful for this unique Wabash experience. They now have a little bit clearer conception of what their futures may hold.